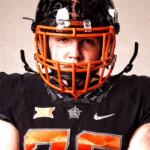 New Mexico’s T.J. Parks and Scott Evans were honored in Chicago on Sunday by the National Federation of State High School Associations. They were both presented NFHS Citations at this year’s Summer Meeting. 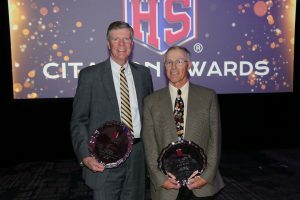 The NFHS honored individuals who have made an impact on high school activity programs through their association. Parks was the Service to State Associations Section 6 winner at this year’s awards. Parks has been involved in education as a teacher, coach and administrator in Texas and New Mexico for the past 37 years, including the past eight years as superintendent of Hobbs Municipal Schools. Parks is currently president of the NMAA and has served on the NMAA Executive Board for 25 years. He was chosen New Mexico’s Superintendent of the Year in 2016. He previously had been inducted into the NMAA Hall of Fame in 2007. Evans was chosen as the NFHS Service to Coaching Citation winner. Evans retired last year after an outstanding 34-year career in education as a high school coach, athletic director and state association administrator in the state of New Mexico. 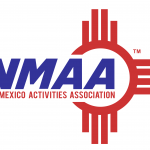 His final 13 years involved a dual job as assistant director of the New Mexico Activities Association and executive director of the New Mexico Athletic Directors Association. Evans received numerous coach of the year awards and was also inducted into the New Mexico Wrestling Hall of Fame, the New Mexico Coaches Association Hall of Honor and the NMAA Hall of Fame. Parks and Evans both have a longstanding and distinguished record of involvement with high school activity programs.